The U.S. Consulate appointment went well this morning. Faith fussed a bit on the ride over but all-in-all, we were thankful to get through the process in relative short order. The girls will not become U.S. citizens until the plane touches down in Detroit on Friday evening. It was good to see the American flag at the U.S. Consulate. There were hundreds of people outside the building, many of whom were seeking to immigrate from China. One of the many things the Lord has shown us during our trip is how blessed we are to live in the United States. We have group pictures this evening that I hope to post later but we’re excited about dressing the girls in native Chinese garb. Stay tuned for that! Tomorrow there is an optional trip to the zoo but between the cool weather and funds getting close, we’ve opted to spend the day in the hotel packing. Friday morning is going to come early. We need to be up at 5 a.m., luggage outside the door at 6:15 a.m. and heading to the airport at 7:00 a.m. for our 9:00 a.m. flight. We will be getting up at 4:00 p.m. Thursday afternoon (Eastern Standard Time) and arriving, Lord willing, in Louisville around 9:30 p.m. on Friday evening. As you can imagine, the prospect of such a day with two toddlers in tow is daunting but we’re trusting the Lord for mercy and grace. We would appreciate any prayers for our travel as well! The past two weeks have flown by. As many of you know, we had to leave Louisville a day early. We were scheduled to leave on Wednesday (2/5) morning at 8:00 a.m. but April received an automated phone call from Delta saying that our flight was cancelled because of poor weather conditions that were coming into the Kentucky area that evening. I checked Delta.com around 11:30 a.m. and our flight had been rebooked for 1:00 p.m. that Tuesday. I had some loose ends to tie up at work but was thankfully encouraged to leave so that I could run to the airport to see if we could be booked on a later flight that afternoon. There was no way we could’ve made the 1:00 p.m. flight as we weren’t completely packed and Graceann was still in school. I went by the airport on my way home and was able to get the last three seats on a flight leaving at 5:15 p.m. I rushed home and what we had hoped to be a slow evening of packing and spending time with the boys turned into a tornado of activity as I had laundry that needed to be washed and dried, bags still needed to be packed, gifts for China still needed to be bought, and a host of other smaller things that needed to be done. On top of all that, April’s grandfather had fallen the night before and had spent a couple of hours outside on the ground until he could finally muster the strength to pull himself into the house. We had all of that weighing on us but we were, by God’s grace, able to make it to the airport and catch what must have been the last passenger flight out of Louisville for the evening. 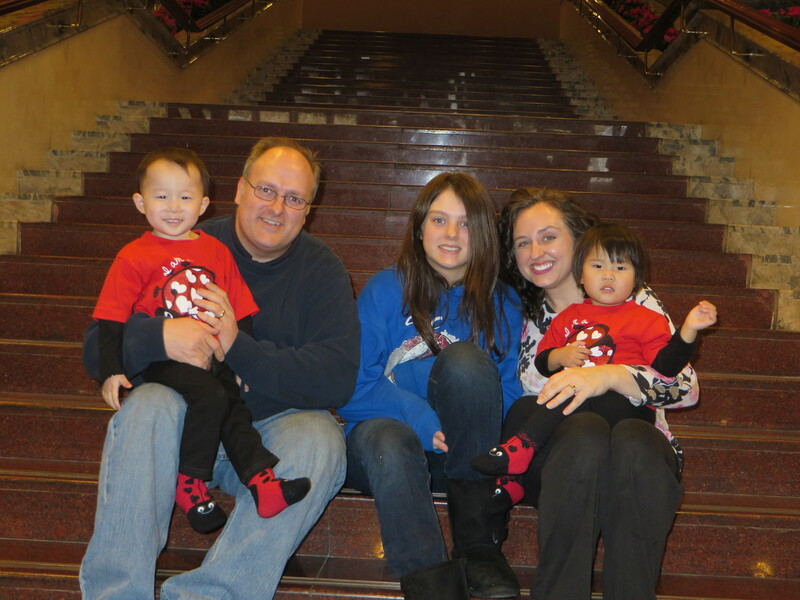 When we got to Detroit, I realized that I had forgotten my two pair of jeans in the dryer. But looking back on our crazy day, I’m thankful that was all that we left behind. My uncle who lives in Detroit was willing to pick me up at the hotel and run me over to Target to grab a couple of pairs of jeans. So sweet to have those people in your life that are willing to pitch in when they know there’s a need, no criticism just a heart open to you and wanting to help. Thanks Uncle Larry! 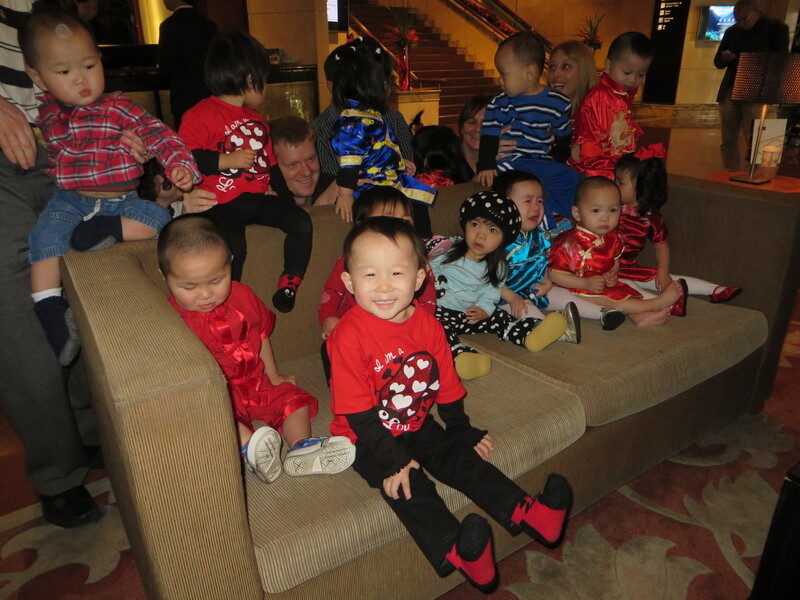 The group pictures went well but the girls HATED their traditional Chinese dresses that we purchased for them. Hope freaked out when we tried to put hers on, we have never seen her behave like that. Faith was unsettled when we tried to put her ‘silk dress’ on so we wound up abandoning that plan and letting them wear something that didn’t bring about such a fight. Below are our group pictures. Finally, please pray for Elijah. Today is his 11th birthday and we miss him (and all the kids) greatly. We hope to call later and get to spend some time on the phone. Miss you all and look forward to seeing many of you Friday! 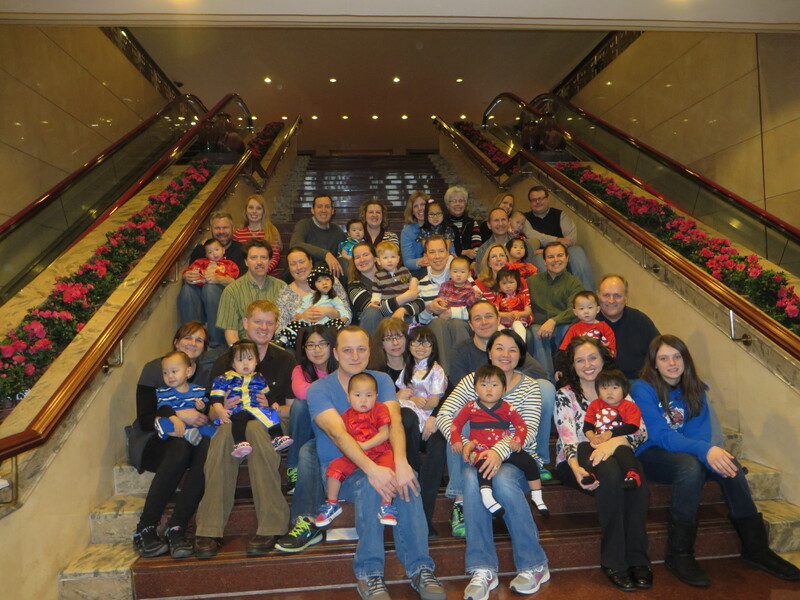 11 families adopted 13 children – these are some pretty amazing folks! Where’d the fried rice go?!?!? Been following your time in China and absolutely loving it! 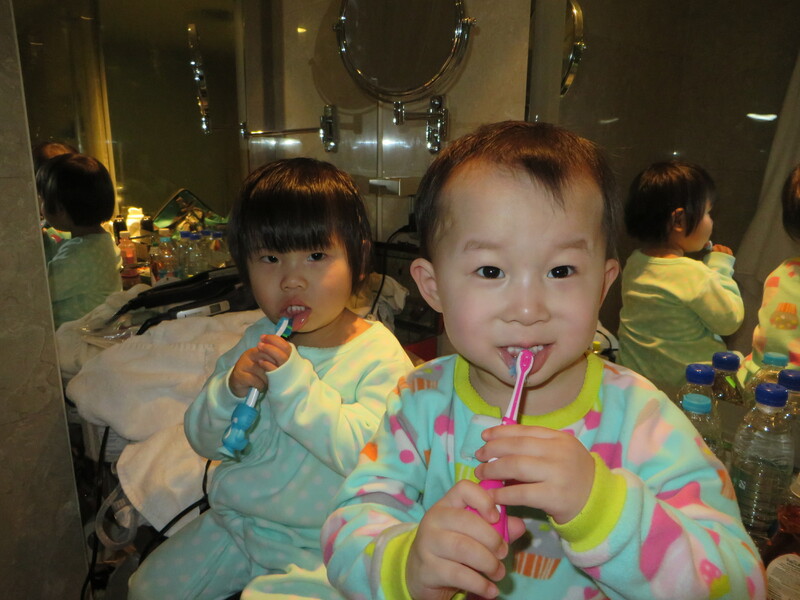 We are adopting an almost two year old little girl from Guangzhou with spina bifida too, and are waiting for travel approval. It is SO neat to see your photos and read your words – it makes it all feel real! We have been praying for you. I hope your last moments in China are very special.